This morning I was contemplating what do draw. Recently I went for a beautiful fall walk and collected a number of beautiful leaves from the trees in the neighborhood. They each had a lovely and unique shape. They were all different colors. I have also been looking forward to some of my family visiting over thanksgiving. One of our guests is my sister-in-law, who makes gorgeous stained glass. 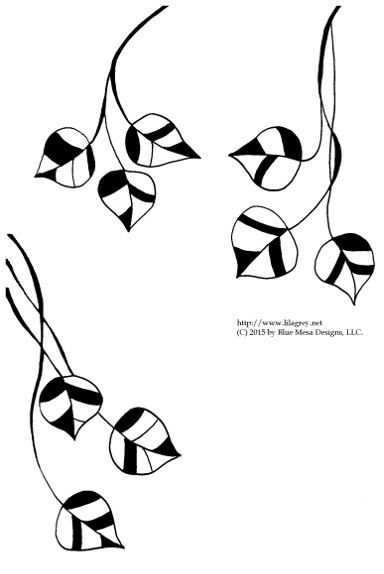 She designed a set of falling aspen leaves which I have hanging on my dining room wall. By the way, I named my dining room “The Aspen Room”. All of the paintings and photographs in the room are of Aspens. So it comes as no surprise that today’s doodles are a representation of the stained glass aspen leaves. I think these would make a fantastic border on an art journal page.